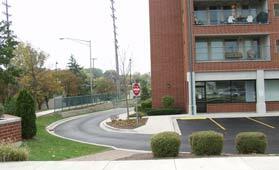 Here is the same area today. 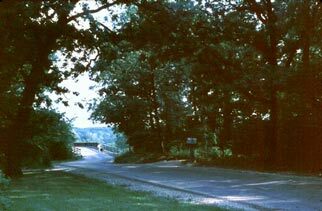 This photo was sent in by BJ Gregory and shows Burlington Ave. in the foreground and the "new" Yackley bridge in the background. As you can see, BJ was sitting in her car as she was taking this picture. What dedication! 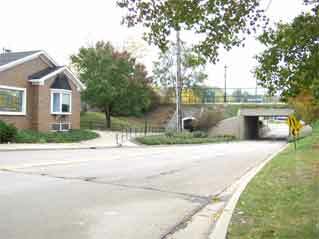 Here's a photo of the same area today. 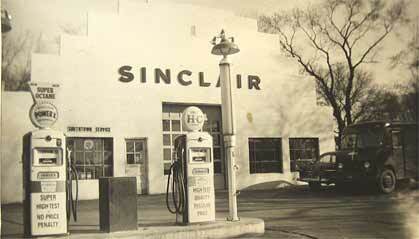 Here is a great shot of the historic South Town Garage Located on Main just south of the tracks. (Like I needed to tell you that!). This absolutely cool structure looks almost as it did back in the day. 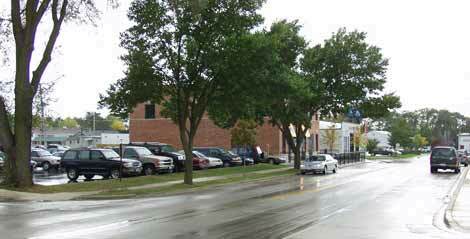 Unfortunately, the "Village" has been set on a long steady effort to rid Main Street of this "eye sore." It probably wont be there for long so stop in and give it a look before it's gone. I included the picture of the air pump / meter because I know many of you remember using it to fill your tires on many occasion. 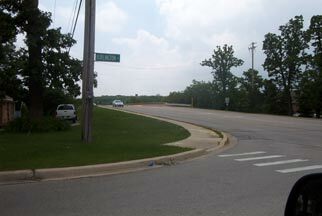 It was located near the far right of the picture. Of course “fluffy” the grease colored white lab mutt/mix used to have his house just left of the door on the left. I couldn't believe my eyes when I saw this one! 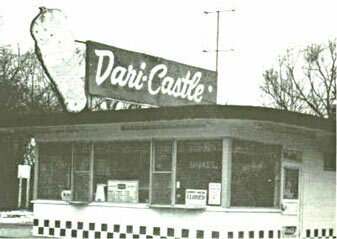 We have been looking for a picture of the old Dari Castle on Ogden forever! Until current Lisle-ite Bob Thompson contacted us and sent us this only known photo. We've received more letters from people wondering about this place. Located at 1624 Ogden Avenue, Dari Castle treated many of us to some of the best "soft serve" ice cream cones and hot dogs & fries in those little red baskets. I'll never forget those thick french fries that had "Ridges." Perfect for scooping up ketchup! YUM!! The photo on the right shows what's left of it today. Oh yeah... That little "Lock Smith" shop is still located just to the right. 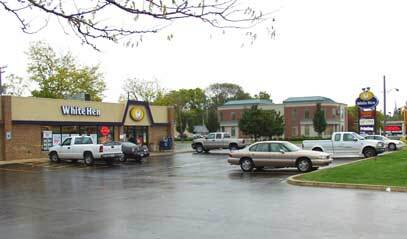 I worked at the Lisle Dairy Queen on Ogden (Or was it Dairy Castle?) for my sophomore, junior and senior years. It was the happening place during the summer months. It was owned by Mrs. Konder who lived just up the street. I don't remember how much the ice cream was but your could get 7 hamburgers for a dollar. You could get hamburgers, hot dogs, fish, steak sandwiches, fries. You could get root beer floats, shakes, malts, sundaes and banana splits. It was a great place to work; you could eat anything you wanted. They had both vanilla and chocolate ice cream. Some of the people who worked there included Mrs. Konder's children, Bonnie, AJ. and Mary. AJ used to sneak out of his house after midnight and ride his horse (which he kept in his back yard) to Downers Grove and/or Naperville. Barb Kubes also worked there. Mrs. Konder's sister was Ann Dooley. At that time I think half of Lisle was related in one way or another. One of the all time classic structures of Lisle. 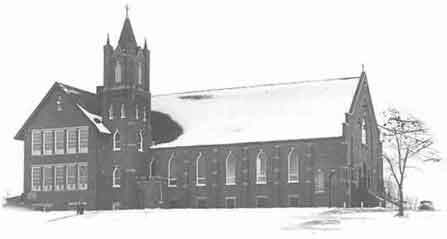 Here is my favorite photo of St Joan of Arc church and school before it's demolition in the early '70s. 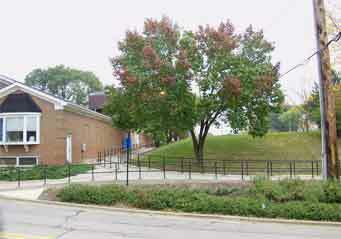 The picture on the right shows the small hill where she once stood. All that remains is a small cement slab where the bike rack was located. 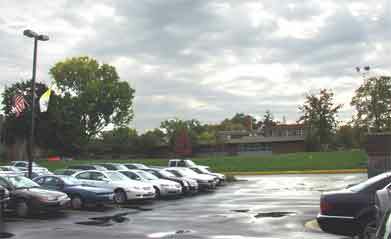 It also shows the parking lot where the bricks came tumbling towards the spectators as the bell tower was hit by the wrecking ball. This photo from the mid 70s is looking east on Burlington from Main. 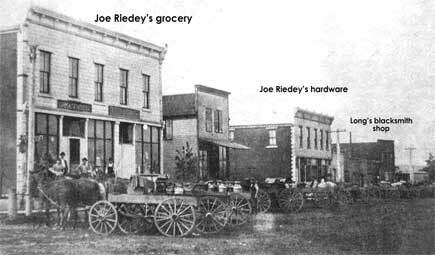 The Briggs Butcher Shop building still stood and is seen on the left. Here is the exact photo location as the photo to the left. This photo was taken in 2005. Notice the telephone pole on the far right of both these photos. 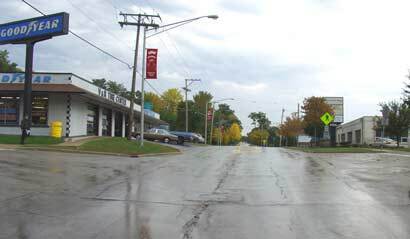 This photo looks south on main towards what used to be the intersection of East Burlington & Main. 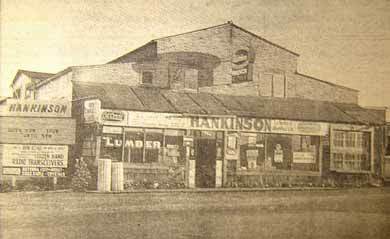 Here is a photo from 1961 of Hankinson Lumber and Supply at 1909 Ogden. 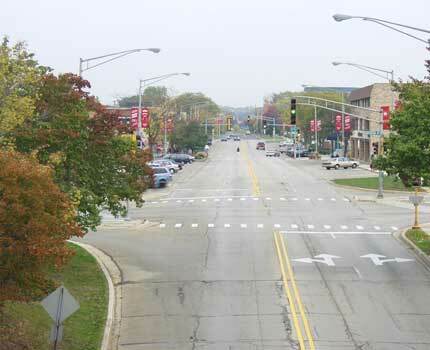 Hankinson's was located there since the late 30s and was a Lisle institution for years. The sign on the left is advertising "Citizens Band Radio Transceivers," along with "Antennas, Coax Cable and Crystals!" That's right good buddy! CB radios in 1961... Who knew?? 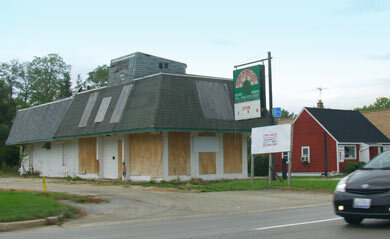 The Photo on the right shows the exact place Hankinson's once stood. 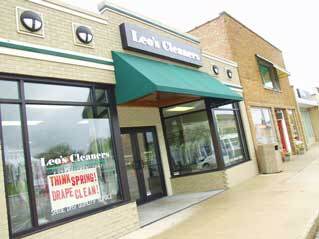 If you've lived in Lisle, you know about Leo's Cleaners... Period! Here is a place that really deserves it's own web page... A true classic located smack dab in the middle of Lisle! 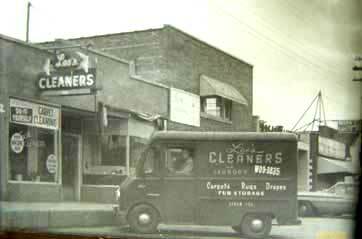 Just walk into Leo's cleaners and you'll see, hear and smell a place that hasn't changed much at all. The outside has had the "new look Lisle" applied but inside is still such a wonderful treat! 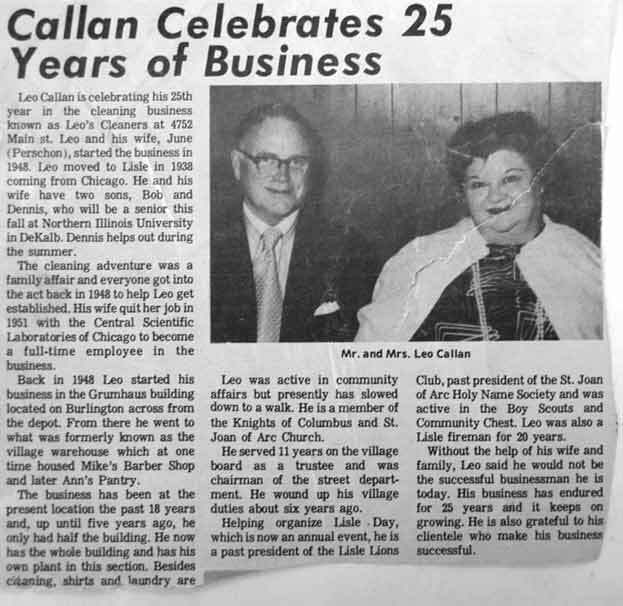 In 1948, Leo Callen and his wife June started their cleaning business in the Grumhaus building located on Burlington across from the train station. (See the old picture above.) Leo then moved his business and it has been at their current location as long as I can remember. Leo's sons Bob and Dennis run the business now. Though so many years have past, all it takes is a quick read of the following article to get a brief insight into the wonderful "Lisle guy" known as Leo. 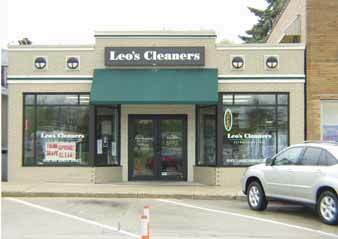 Leo's family and Leo's Cleaner's are truly Lisle Classics! 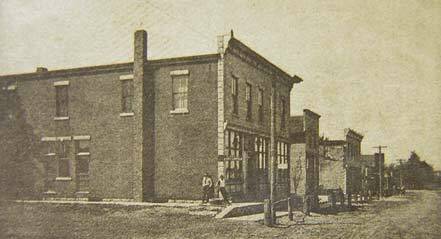 Henry Schmit operated this general store and post office in 1888 in the Haumesser buildings located on the corner of Ogden (known then as Joliet Road) and Main. 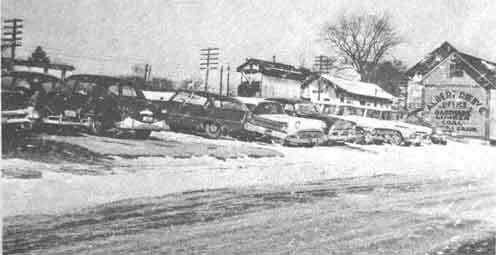 That corner eventually became the Texaco station and is now a modern "general" store known as White Hen. 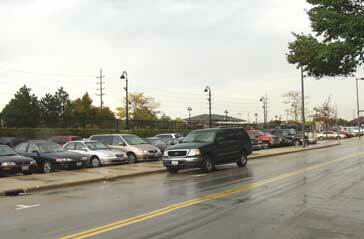 I think those people out front are waiting for one of those cool "Vanilla Mocha" coffee machines to arrive? Get a load of this picture from 1948! 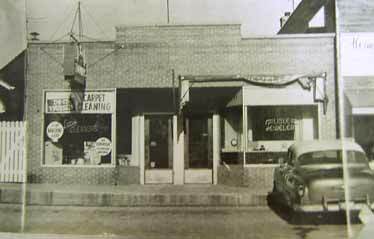 This building has played many roles in Lisle including a clothing store, dry goods store, antique store, library, the Minuette Restaurant and today the Fox Restaurant. Also, have you ever stopped to wonder about that cement plaque that was located just above the window that is just above the front entrance? I always wondered what the "G-S" meant on that plaque. Well! While doing research for this page it finally dawned on me... Eureka!! I think I finally figured it out! See if you can too. 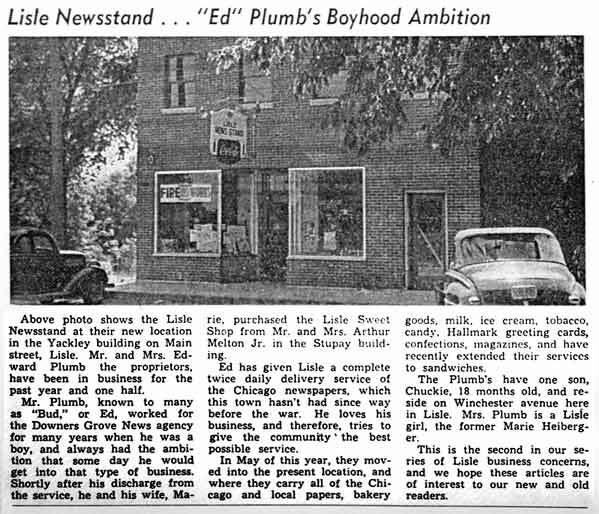 Click here to read an article from 1948 about the original owners and the history of the building itself. And good luck! I love this! 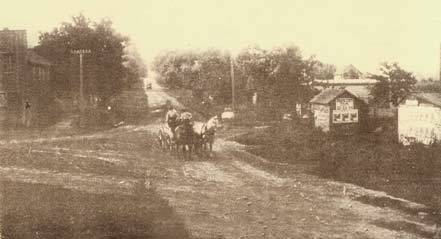 Back in 1909, some guy took his camera and stood next to this bustling road and snapped this photo. Now, almost a hundred years later, I'm doing the same thing! Kinda cool! 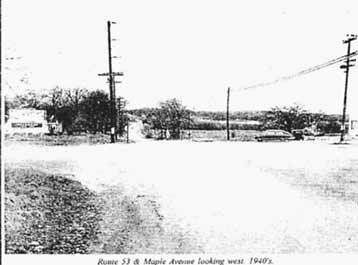 Of course this is a view of the intersection at Main Street (Known then as South Rd.) and Front Street (Known then as Main.) Our view is looking south up Main. 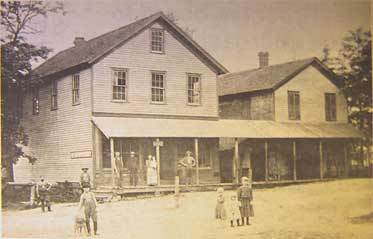 Long's blacksmith shop can be seen on the left. 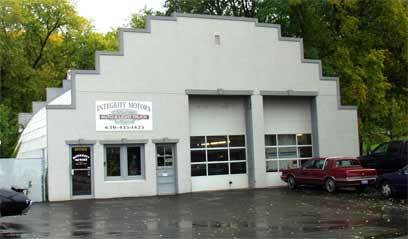 It later became the first Lisle Fire Department and now is the proud home of a tire store. Also in the picture on the left, a sign on the right advertises the opening of the "Wheaton County" fair. 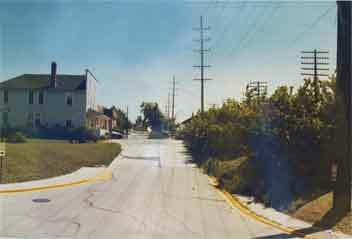 On the left is a photo from the 1960's looking north/east on Front Street. In the background you can see the Lisle train station...In the foreground is a shed with a sign that says "Albert Riedy Office... Hardware, Lumber, Coal and Grain." The photo on the right shows the exact view today. The train station has been moved, the hill has been graded down, and the cars now have "crumple zones" and satellite radio. Go figure. Any way... The photo on the right shows the exact location where the little "mystery" building used to stand. 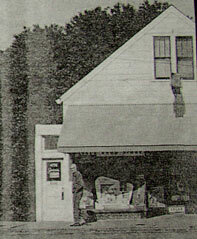 Here is a photo from 1948 of the Lisle News Stand. Here you could buy the paper, doughnuts & bread, milk, greeting cards, and yes... Even fireworks! Take a good look at the "now" picture because this building, along with all the buildings down town, are soon to be covered with a "new face." Click here to read more about this great little building and it's history. I can't tell you how many times I've flown past this place on my fat tired bike... On my way to the Book Nook! 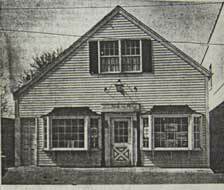 This building, at 4734 Main was built in the 1930s and was a dry goods store for years. 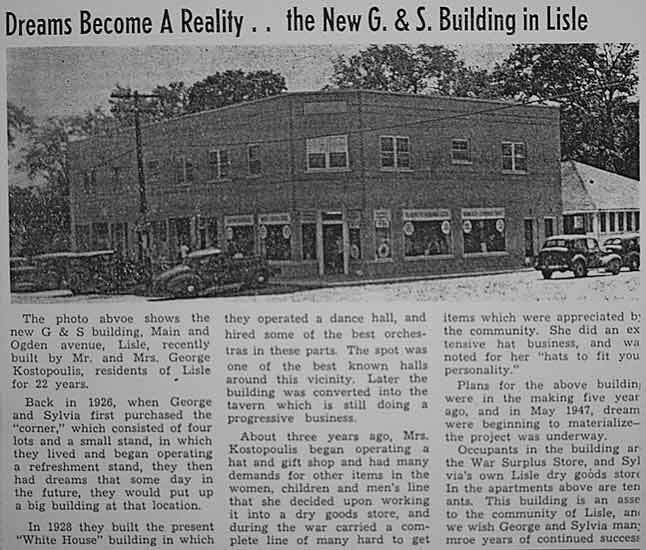 It then became Lisle Drug Store for many years as well. 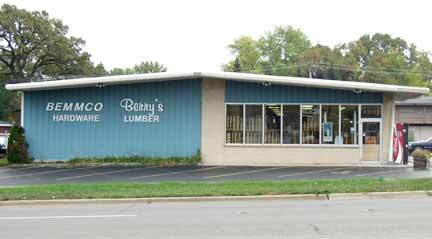 It was owned and operated by long time Lisle-ite Harry Reynolds. In 1967, the exterior of the building was remodeled into a what was referred to as a "Colonial style beauty spot" and became a real estate office. The bottom picture shows how our "Colonial style beauty spot" appears today. I guess it really doesn't matter what year the picture on the left was taken. It doesn't really matter because the memories in our hearts of those wonderful "uptown" parades are probably more vivid than any picture could ever be. Fourth of July, Memorial Day, Homecomings... 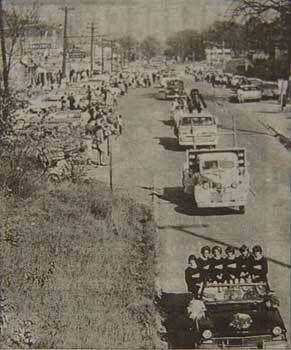 The crowds of people from all parts of our town were there. Families were together everywhere. Everybody knew somebody! The sounds of the fire trucks! The "garage built" floats! The horses! The sound that a handful of candy makes when it hits the road in front of you and slides in every direction.. And us kids dashing to pick up the candy like it's a matter of life and death! These were our small town celebrations! It cracks me up to remember what a big deal it was. It was never really fancy... In fact, at times it seemed kind of hokey... But looking back now I realize that it wasn't the sophistication or the "money spent" that make these times so special in my mind.. It was the simple fact that it was our town... And it was our safe little platform that we all could watch the rest of the crazy world explode from. Maybe it's not what Lisle was... Maybe it was what Lisle represented..
Click here to see an amazing close up of the photo on the left. Thank you Bob Thompson! We plan to add to this page as content becomes available. We welcome your comments, stories or photos!